1. Attend your sister's camp Visiting Day in the stifling heat. Take refuge with your family in the ac'd staffer lounge, where there is a pool table. 2. While your mom and dad are standing on line at the canteen to get cold drinks, pick up a pool stick. When your mom comes over and tries to help you better grasp it, ignore her and hold it the way you want to. Maybe it looks uncomfortable to her but you're the one with cerebral palsy and you know what works for you so buzz off, Mom. 3. Start pushing the balls into the pockets. You don't need that white ball, anyway. It's just as fun to directly knock the balls in, and just as satisfying to hear that "thunk!" 4. Not notice and/or care when people watch you curiously. Who the heck cares what people think? You're having a good time and that's all that matters. 5. 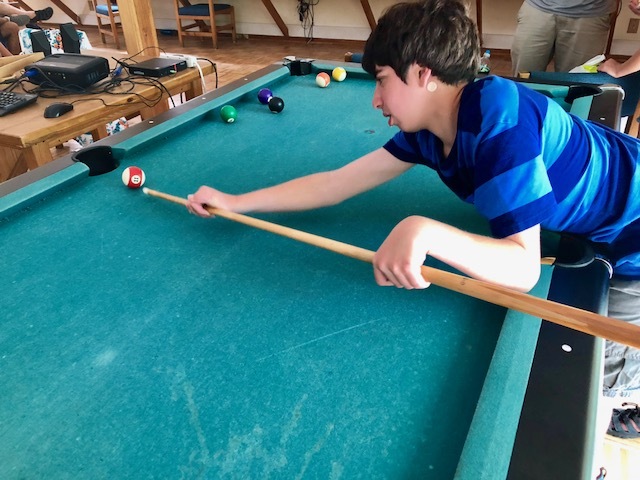 Really, why does there have to be just one "right" way to hold a pool stick or play pool? The right way is whatever works for you. 6. If only people cared less about the "right" way to play, to move, to talk, to look, to think, to be, people with disabilities would face a lot less prejudice and discrimination in this world. 7. When your little brother grabs a couple of balls and takes off with them, laugh. He's silly! 8. Finish knocking every single one of the balls on the table into the pockets, on your own sweet time. 9. Flash your parents a victory grin. Because you did it. Your way. The best way.